Which companies could benefit from Harry and Meghan's baby? The birth of a child that is seventh in line to the throne might not light U.K. retail spending on fire. However, given how smitten the world is with expectant mum Meghan Markle, there are a few companies that could benefit in the months ahead. There’s a reasonable likelihood that anything the Duchess of Sussex wears during her pregnancy, particularly maternity dresses, will sell out if consumers can get hold of them or something similar in style. That could also happen with anything the parents dress the new baby in. This happens consistently with the Duchess of Cambridge, where a dress worn by Prince William’s wife will sell out as soon as she is pictured wearing it. Dutch stroller maker Bugaboo International BV got a lift when Kate was pictured pushing her children around in one of the company’s pushchairs. Contrasts in styles could also matter. Differences in how Meghan and Kate dress will probably be highlighted in the media, Paul Hickman, head of consumer research at Edison Investment Research, said by email. This could drive additional sales for producers and retailers that sell items similar to those worn by Meghan as they look to tap into her style choices. So watch specialist baby products retailers like Mothercare Plc, department stores such as Debenhams Plc and the Sports Direct International Plc-owned House of Fraser plus potentially very small lifts for the likes of Hennes & Mauritz AB, Zara-owner Inditex SA or Asos Plc. 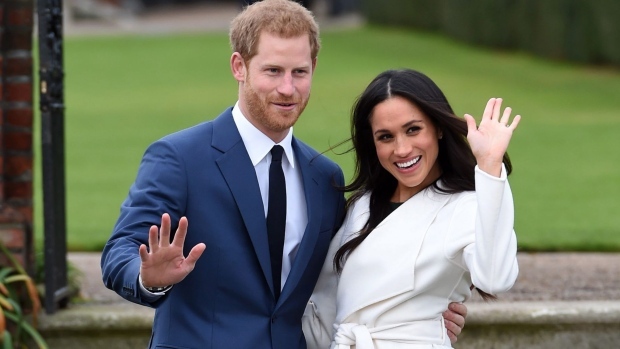 While grocery spending is unlikely to get a boost in the way it did when the Duke and Duchess were married, there may be some residual benefits. For example, when Prince George went to school for the first time in September 2017, there was a surge in demand for Puy lentils after they appeared on his school lunch menu, Hickman said. Again it would be very minor, but bookmakers could benefit from people placing bets on the name of the baby and possibly when the baby will arrive. Ahead of the birth of the Duke and Duchess of Cambridge’s third child, the bookies saw a surge in wagers on Albert as the name. The couple ended up calling him Louis.